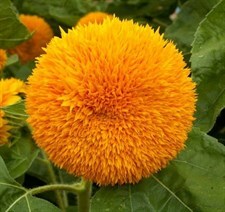 Sunflower 'Teddy Bear' Big, double, fluffy teddy bear of a flower, producing very dwarf, 15cm (6in) ultra double golden-yellow blooms. 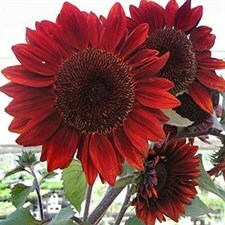 A real eye-catcher in the border, looks good in containers and is a must for its long lasting, impressive appearance in a vase. Height 45cm (18in). Spread: 30cm (12"). Now there's something new! 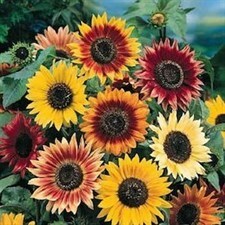 A completely original and amazing effect can be achieved with Dwarf Yellow Spray, this exciting new Sunflower. The neat, dwarf habit can be used to create an unusual hedge to enclose your beds and borders. Height: 45-60cm (18-24in). The green buds before the flower opens are delicious cooked in butter sauce and the seeds make a tasty snack. 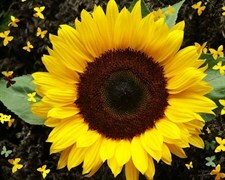 Click here for more information on cooking and decorating food with flowers.